The road from the Thai / Cambodian border at Poipet to the city of Siem Reap is unpaved and in an abysmal state of affairs. As every local will tell you this is because the airlines flying to Siem Reap have been paying off the government to ensure no work is done on the road. Three O’clock in the afternoon myself and twenty two others crammed ourselfs on and in a Nissan Ute and started the journey. 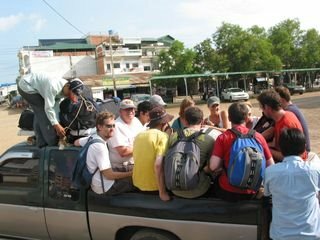 With so many people overloading a vehicle the best strategy is to find the least uncomfortable spot and hang on for dear life. I decided that for me that was sitting on top of my pack with my legs dangling over the side. When we were two hours into the trip the heavens opened up and a deluge of biblical proportions came down soaking everyone and their luggage. As an added extra the wheels of the ute would trow up plenty of mud to add to the festivities. Then the road really deteriorated with water running across it and bridges missing in various places. Inevitably this resulted in us getting stuck several times in the middle of mud bogs or rivers and having to jump of the ute and help push it out again. The most surreal moment came when we were in the middle of a flood plain the ute being towed by a tractor with us walking behind and up to our middle in the water when a boat carrying some fishermen came sailing by. And I do this for fun?